Asparagus is in season in California! If this news doesn’t make your heart smile, it should. There is so much to love about this healthy, fit friendly veggie, and so many opportunities to pick it up from local growers. And now, for the answers to all your burning asparagus questions, here are some fast facts that will get your mouth watering. There may be times when you can find it earlier though. Since asparagus is a flowering perennial (meaning it comes back every year without needing to be replanted) it blooms and grows according to the elements. If it has been an especially warm winter, you may be able to find it locally as early as February. There’s no question that asparagus is a healthy vegetable. If you’re looking to get fit and feel healthy, it’s a great ingredient to add to your diet, and is a staple in any clean eating menu. One special nutritional aspect of asparagus is that it has quite a bit of protein for a vegetable. Just one stalk has nearly ½ a gram of protein. That may not sound like much, but when you consider that each stalk is roughly a mere 3 calories, that protein really adds up. It’s also full of fiber, which is great news for people watching their carbs. Every gram of fiber can be subtracted from the carbohydrates in the food to get a net value of active carbs. A cup sized serving of chopped asparagus weighs in at 5 grams of carbs, but contains a whopping 3 grams of fiber. That’s only 2 net carbs for an already low carb food. 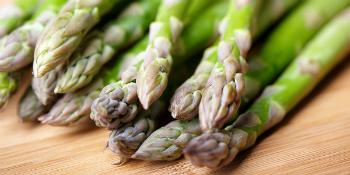 Asparagus has all kinds of amazing vitamins including folate, vitamins A,C,E, and K, and trace minerals such as chromium Plus, asparagus is a natural diuretic, so you’re feeling bloated or puffy, consider putting some asparagus on your plate. Now you’re asking yourself, “If asparagus is so great, how can I incorporate more of it in my diet?” You can get as complicated as you want with the preparation, but the simplest is sometimes the best...and the easiest. If you’re on the go or have a family keeping you busy, simple recipes for healthy meals will be the easiest ones to prepare. Check out this recipe for roasted asparagus and just try not to love this vegetable. Spread the asparagus in a single layer on the prepared pan. Lightly sprinkle with coarse sea salt and freshly ground pepper. Drizzle on the garlic-oil mixture. Roast for 8-10 minutes, until the asparagus are bright green; do not overcook. People go ga-ga over asparagus. Stockton, CA even hosts an entire event dedicated to the humble asparagus. This year the 2015 San Joaquin Asparagus Festival takes place April 17, 18 & 19 at the San Joaquin County Fairgrounds. Entertainment includes concerts, a parade, craft beer and wine pavillion, and rides and games for the kids. And of course there’s the food. The asparagus festival is famous for showcasing the many creative and delicious ways asparagus can be prepared. From fried to pickled, you never know what you’ll find at the Asparagus Festival. But you can bet your asparagus it’ll be good.